#yurtlife – what happens in the yurt, doesn’t stay in the yurt. 9.20 AM – Sam and I meet in the Meadows to walk to the book festival. We realise that ‘the meadows’ is not a great designated meeting point. We were supposed to set off at 9. 9.20-.9.50 AM – We walk to the festival. I ask Sam how I look. He says ‘professional’. I’m not sure how to take that. Sam seems cool and collected. I think I might have diarrhoea. 9.53 AM – We approach The Yurt. We both seem to have reverted back to our awkward teenage selves. There’s a lot of mumbling from us, and a lot of raised eyebrows from those present in the yurt, who look at home and not at all intimidated by the fact that the press organiser is speaking to someone from the BBC. Sam introduces me as Beci Boss. It’s a stellar Freudian slip. 10 AM – We get our press passes. 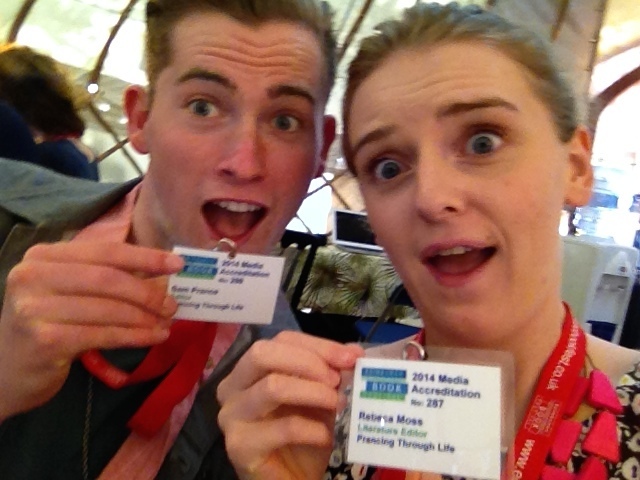 We are now real journalists, the Edinburgh International Book Festival says so. Unfortunately this is not a lasting conviction as we realise that the people next to us are from the Guardian and everyone seems to know each other. We know no-one. 10.01 AM – We leave The Yurt, and go on a tour around the Festival Site. We settle outside the Children’s Bookstore, our new safe place. A lot more happened after this, including us getting to see and hear some extremely cool writers, and unsuccessfully trying to photograph a couple called Peter and Carol, but we’ll save this and Hannah’s joining us for a later date. 10 PM – I leave the Festival alone after seeing Xiaolu Guo. As I exit, I see a party going on near one of the stages. The area is cordoned off, and there’s a sign which reads ‘Private Party – Invite Only’. Plenty of familiar faces from The Yurt are in attendance. We are not real journalists. Rebecca Moss studies French and Philosophy at the University of Edinburgh. She is also the LITERATURE Editor of Prancing Through LIFE. In her spare time, Rebecca (Beci) likes to cook, bake and blog about it over on: www.herbsandstitches.com. One day she hopes to become Mary Berry and assure everyone that she never has a soggy bottom. An admirable aspiration. I read this article and found it very interesting, thought it might be something for you. The article is called Beci & Sam Aren’t Real Journalists – #yurtlife and is located at http://prancingthroughlife.com/2014/08/16/beci-sam-arent-real-journalists-yurtlife/.